KAMPALA – The Inspector General of Police Gen Kale Kayihura arrived back into the country on Monday morning after weeks of speculation regarding his trip overseas and his health. Gen. Kayihura has been away for two weeks on an official trip in Turkey, fuelling speculation especially on social media about his health. According to an aide, the police chief netted in at 3.am Monday morning and he was home resting. “Yes, he arrived safely,” the aide told PML Daily. The persistent negative speculation about the IGPs health forced Police spokesman Asan Kasingye to circulate pictures of Gen. Kayihura visiting a forensic lab in Adana, Turkey- some 650 kilometres north of Ankara on Saturday. 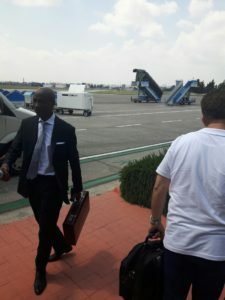 Uganda’s Ambassador to Turkey, Moses Kasujja is seen in the pictures. Mr Kasingye wrote: “Photos of IGP, Gen. Kale Kayihura visiting Adana Forensic University today. Andana is 650 Kms away from Ankara. He will arrive tomorrow Sunday, 18/06/2017. A team of Uganda police officers will visit the Forensic University at the end of the month. On the photos is the University dean and Uganda’s Amb. to Turkey Amb. Moses Kasujja”.